Most people seem to think that building anything yourself in N-gauge is near impossible. That is of course absolute nonsense. 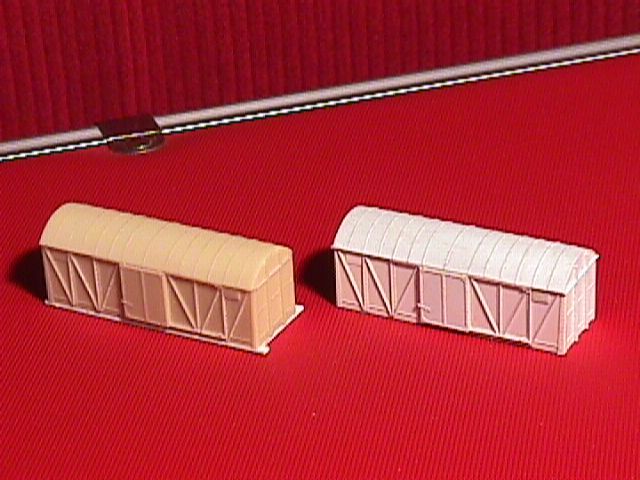 Building your own wagons is not usual in N-gauge. Fact is that it is much easier to built a wagon than a small dwelling or locomotive. What you need in the first place is some kind of drawing. If this drawing is in an queer scale, like 1:87 or such, then scribble all dimensions you are going to need into it. Alternatively you can scale it on the copier to 1:80 so that you can easily measure distances and don't need a calculator. Of course photographs come in very handy too because actual wagons generally differ from drawings. These also give information on painting and weathering. You will allways find out that you have incomplete information on the subject as some parts of wagons always seem to be hidden from view on all photos. Unless you want to model a wagon in use as shed all wagons normally have at least 2 axles with 2 wheels each. You need to decide early on which ones to use and how you are going to fix these. You can either make your own wheels with a lathe or buy these from a main supplier and use these as half fabricate in minidrill operation. The axle bearing parts you can make up from folded or soldered brass sheet. 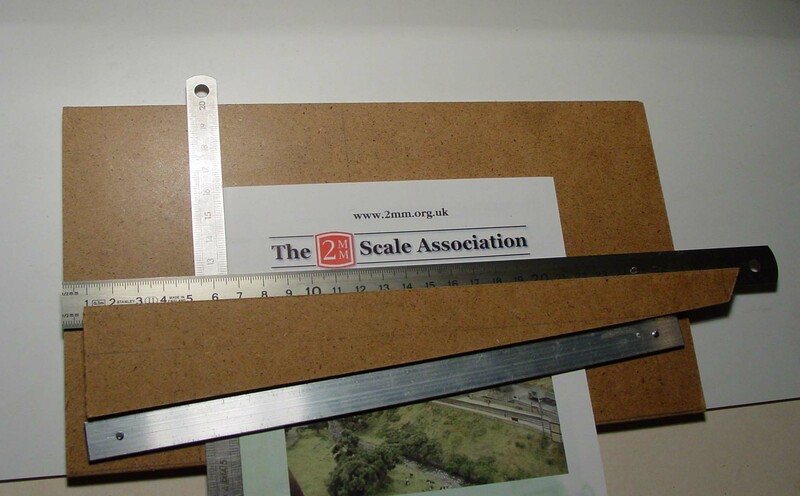 If you become member of the 2 mm Scale Association you can use a limited amount of components for FS160. Such as wheels, tophat bearings, axle guards (to modify) and some type of springs and axlebox. I'm not aware that there are useful components on the german market so in general you have to copy springs and axlebox parts from other wagons or you can built your own master. As wagon base you can use a piece of 1 mm thick brass as floor. Using this you can solder the metal axle bearing parts. check this page on UIC wagons for a practical approach. It is possible to produce a so-called compensated frame with three point suspension. The compensated axle can rotate slightly around a vertical plane through the centerline and results in better track keeping theoretically. However on well laid track it is hardly worth the effort. If you make your base floor slightly smaller than your wagon then you can glue the solebars and bufferbeams against the sides of this sheet. A two component epoxy is suited for that when using different materials. 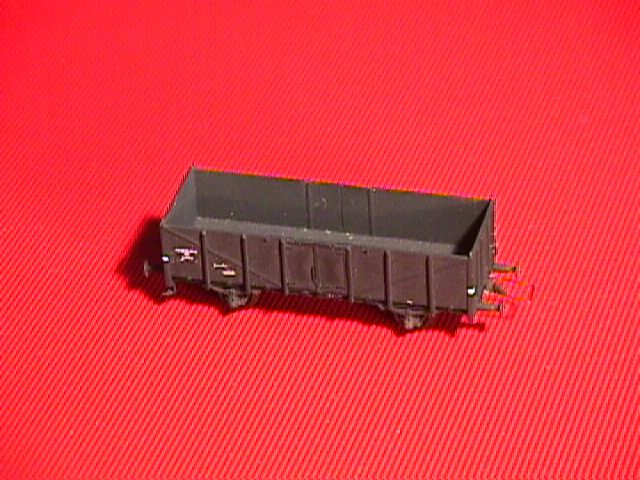 Flat and open wagons are easiest to start with because they generally have the least detail. An open wagon is nothing more then 4 walls sitting square around a floor. I find in general easier to fit the shorter ends against the longer sides. This photo shows a NS darkgrey (they call it blue!) wagon that is built like this. This wagon is built entirely from plastic with a piece of lead glued to the underside of the floor for weight. The (compensated) axles and bearings are 2 mm SA components. Started was with a long strip that was scratched with planking using skrawker and scraperboard knife. For this you can use an angular board for higher accuracy and parallel cuts. Home made angular board to an idea of Geoff Jones of 2mm fame. After that the inside doors were indicated and the various parts cut to length. The inside floor was done in the same way. The parts were then glued together and detailing could start. These are mainly strips glued in the right place. The doors are of 0.1 mm sheet cut with a cross cut in the backside and than folded along the line and flatted out again. You can then glue these along the rim and detail the circumference with strip. In this case the strips carried rivets. These can be made by rolling a sharp teethed cutting blade along a sheet and cutting parallel to this line into strips. Takes longer to write than to do. The eyelets for the ropes are made with a minidrill. First drill a .3 mm hole in a piece of rod or thick strip. Without taking the drill out of it, sand away the overscale thickness until you are left with a tiny tube and cut to pieces. Glue these pieces to your wagon. Handrails and steps can be made from thin springsteel and brass. This was my first wagon, building time was some 3 evenings including developing the techniques. Compare it with a standard rtr Om12 open wagen and see the differences. The long flat wagon with rungs is another example this time built using a flat piece of brass for stiffness. 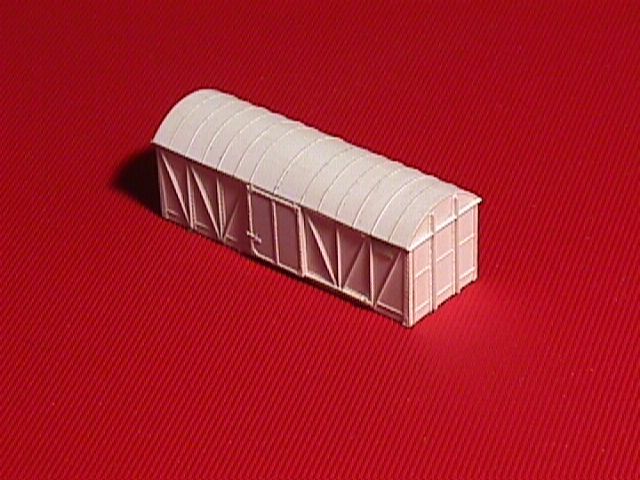 The bogies are from brass strip with GFN sides glued to it. The bogies are screwed to the brass plate. The rungs are shaped from 1mm square Evergreen strip but are fragile. Depending on the number of fine details you can use such a mould between 10-40 times to make a copy. Your mould will gradually deteriorate, which means that you sometimes tear off pieces of details from the mould when you take out your casting. Also small bubbles seem to appear after X copies unless you use either high pressure or vacuum system to cure your mould to suppress all air bubbles in the silicon. Generally you can repair the copies until it becomes a bother. A mould is made by taping the model into a box made to size, leaving about 1 cm clear on all sides. After that 2 component silicon rubber is mixed and poured in the box. After 1-24 hours you can take your original out again. Of course you cannot make a complete model in it as some details cannot be copied. You still have to finish each individual model with handrails, steps and any undercut details that you cannot cast. But each raw casting takes only about 15 min to retrieve the state of the original which took 3-4 evenings to produce. I regularly use this copying technique to take shortcuts. For instance on Spaubeke the frontwall of the station is copy of the backwall. Saving some 300 individual cut pieces of plastic. In this case the mould is used only once but the timesaving was enormous making more than good the cost of silicone and casting materials. But you can use also this technique to copy springs and axlebearings for your own models. Or cast additional ventilators on roofs of diesels. Or built one diesel masterfront and cast two equal copies. Alternatively you can use it to repair things. For instance repairing a broken body by making a copy of the intact front. Another use is to make a backup of your work. If you are working on a difficult model and the next operation has a high risk of spoiling your work than you can first make a mould to preserve your work. Silicone rubber is relatve expensive, about 30 euro per kg. The price of PU is even higher. Minimum quantities are often 1 or even 2 kg. Instead of PU you can also use epoxy or materials such as gipsum, or other stonecast materials, all depending on the object and its use.